These umeboshi pickled plums are mildly seasoned and made with high-quality koume plums from Kishu. Product totals 160g (about 63 plums). The term “umeboshi” refers to ume plums that have been subjected to a traditional method of drying and pickling. 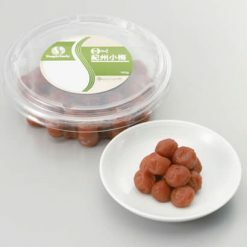 Umeboshi are extremely popular in Japan. They contain antioxidants, and are rumored to be good for fatigue, hangovers, and various digestive-related ailments. They may also help to prevent ulcers. These particular umeboshi pickled plums are made using particularly soft and delicious koume plums from Kishu. They are pickled in a mild-tasting seasoned brine, and retain their natural sourness. They are so delectable, you’ll find yourself eating one after another! 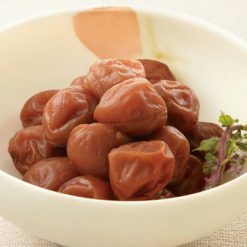 If you love umeboshi but live in an area where they are hard to come by in grocery stores, Sugarlady’s frozen umeboshi can make it easier to have these unique pickled plums on hand whenever you need them. As a sister product to these Kishu koume plums, we also sell Kishu umeboshi pickled plums made with nanko plums. Simply defrost and enjoy.In Japan, umeboshi pickled plums are frequently used as the centers of onigiri rice balls, or placed atop a bed of rice in a bento box to resemble the Japanese flag. If you prefer to use umeboshi as more of a seasoning than a primary flavor, they can also be cut up and applied as an ingredient in a variety of foods, including dressings, salads, marinades, and more. Umeboshi can even be used to make tea! This product contains ume plums (Kishu), pickling brine (table salt, sugar, apple cider vinegar, kombu seaweed extract, enzymatically hydrolyzed wheat gluten, yeast extract), ethyl alcohol, vegetable colorants.. This product is not suitable for anyone with allergies to wheat or apple. Origin of ingredients: ume plums (domestic). Prepared and packaged in Japan.